In November, thanks to the generous support of eCampusOntario through the Student Supports initiative, we were able to sponsor a student (and myself) to attend OpenCon 2017 in Berlin. Landon Tulk, a student advocate at Western University, was selected to discover what OpenCon has to offer. After an exciting conference program and some intense community building, it’s safe to say that Landon and I drank the OpenCon kool-aid! OpenCon is an annual conference that provides a platform “for the next generation to learn about Open Access, Open Education and Open Data.” OpenCon is not a typical conference. The program offers a unique platform for early-career professionals to learn about open. It’s also an opportunity to explore new ways of promoting/implementing open through various sectors, disciplines and areas of practice. 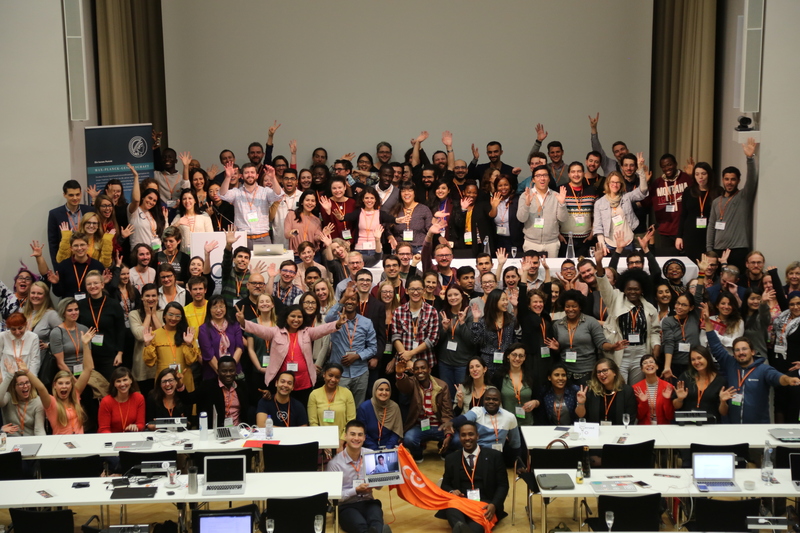 What we discovered early on in the program is that OpenCon is more than a conference, it’s an ever-growing community of open practitioners. It’s a safe space to discuss, challenge and learn about all things open. We heard from a diverse group of open champions through keynotes, panels and interactive workshops. In fact, over 68 countries were represented at the conference and what surprised us the most is how “glocal” the open initiatives can be. Almost every ‘issue’ or initiative showed patterns across the globe. Both local and global efforts to expand open policy and practise share similar challenges, perspectives and passions. Most importantly, the conference instilled in us a philosophy of open: that information placed in the public domain is far more beneficial to society than if that same information were to be kept closed. Especially in the public sector, the philosophy is if it’s publically funded, then ‘it’ should be publicly available. What we also gained from the conference was the opportunity to actually do something with the help of experts. During the final stretch of OpenCon at a ‘do-a-thon’ session, Landon and I created a rough toolkit to help open advocates better understand the complexities surrounding open adoption and the potential for open washing. OpenCon sparked the idea that the best way to advocate for open is to start by understanding why one wouldn’t use open. The toolkit is essentially a mock conversation between an open expert and an open resister. The toolkit acts as a resource for early-career open champions who may be confronted with questions such as “why should I use open if I sell my textbook to students?” or “I’m a faculty member and I have sensitive personal data, why would I use open?” This was just the tip of the iceberg for the possibilities explored at OpenCon. So, in between devouring Currywurst and exploring the remnants of the Berlin wall, OpenCon embedded in us a sense of community; gave us a fresh glocalized perspective of open and pushed us to produce something of value, which I plan to bring back to eCampusOntario. But the real energy does not come from the conference itself but from what follows, which is the sense of pride you receive from diving into a community of open practitioners. I still feel connected to my fellow conference goers. By way of the community, I feel empowered to make a difference with the knowledge, resources and tools at my disposal. Speaking for Landon and I (he signed off on this! ), we highly encourage anyone, especially early-career professionals to apply to OpenCon 2018 and see what the community has to offer. Article written by Chris Fernlund, Project Lead, Student Services. Follow him on Twitter @fernfeed.